5 years ago today I began calling a 1991 MR2 turbo my own. I remember seeing it clearly for the 1st time a couple months prior, I knew what the MR2 was but had never gotten to see one in person let alone touch or sit in the little Toyota. It was listed for sale by a local used car dealership owned by family friends, this allowed me the opportunity of sit in it at 15 and enjoy it's driver oriented interior. Inside the MR2 is very simple with no frills, I was fascinated with it's dark blue seats and dashboard along with the little turbo pressure guage. Today I decided to go and take a few pictures, looking back I'm surprised I haven't taken more over the last half-decade. I guess I'm guilty of taking it's simple beauty for granted at times. It's not the fastest car, best handling, or most beautiful car but I honestly wouldn't trade it for anything. I've had the opportunity of driving an assortment of cars and there's always something missing in them that the MR2 has. Driving it is a raw experience, there's nothing between you and the road. 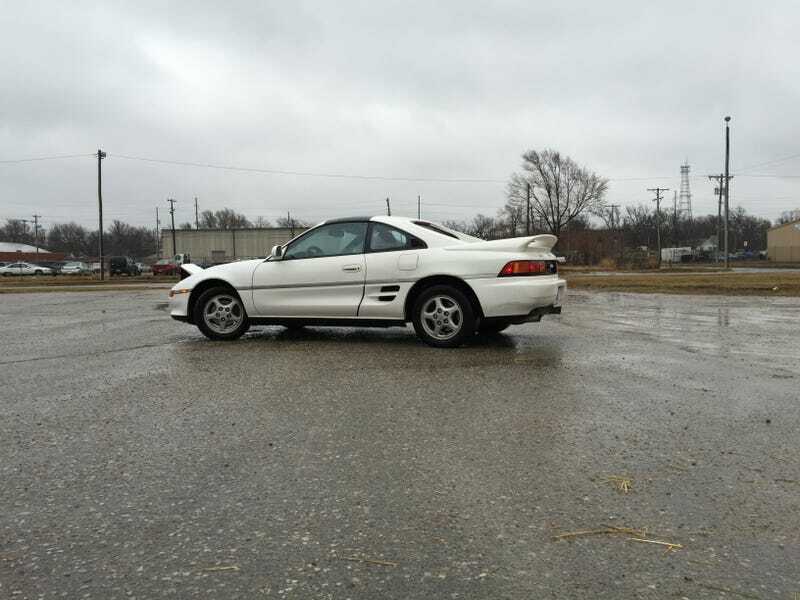 It has no power steering which leaves the MR2 with a less than perfect steering ratio but also gives excellent feedback. Then there's the visibility, with thin a-pillars and a fairly short and low hood it's easy to discern where the edges of the car are located. Toyotas from the 1990's are notorious for their impeccable reliability and my MR2 has been no different. Up until last summer it had the original clutch, it currently has the original turbo which I hope to rebuild in the near future. Simple maintenance is a breeze to do but digging around the small engine bay isn't exactly fun, however, that's a small price to pay for ownership. It is stock which is how I intend to keep the car, simply replacing and refreshing parts as needed. The odometer turned over 200,000 miles about a week ago which gave a renewed appreciation for Mister. The interior is far from roomy but it envelopes you in a way which lets you forget about driving the car and allows you to focus on simply moving. It's a incredible experience that's tough to put into words. One would expect any car to become somewhat mundane after a long time but regardless of what I'm doing or how my day has gone I'm able to look forward to the drive. Whether it's going to work, driving home, or just cruising for no reason at all sitting behind the steering wheel is a wonderful experience which I look forward to having for a long time to come.